Fact: The United States has never medaled in table tennis at the Olympics. Fact: No United States Player has medaled at the World Table Tennis Championships since 1956. Is it fair to conclude that the United States grooms poor table tennis performers? Undeniably, it is hard to dispute this claim. The United States lack of success in international table tennis is exhibit A and B, and the prosecution would need no further questioning. But the past is the past. There is always a future. Introducing Michael Landers and Ariel Hsing, two U.S. table tennis prodigies, one male and one female, poised to make the U.S. contenders in the sport of table tennis. 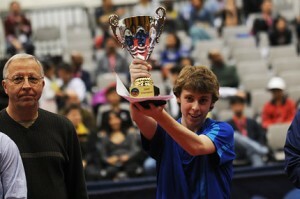 In 2009, Michael Landers ripped through a field of more experienced competitors in route to becoming the youngest ever U.S. Men’s Singles Champion at the age of 15. And then, in 2010, it happened again; Ariel Hsing became the youngest ever Women’s Singles Champion in the United States. She was also just 15 years old. The story is simply captivating, and this is why Mina T. Son & Sara Newens, two filmmakers stationed in Palo Alto, CA, have decided to document these two on their journeys toward table tennis greatness. Landers and Hsing represent the future of table tennis in America. Recently, the sport has had a domestic resurgence, as ping-pong has become an extremely popular bar sport. Now ping-pong (or table tennis) needs a face. Landers and Hsing have the potential to be America’s ping-pong ambassadors.